Well... this morning is a sad morning!! My sweet nephew, Luke, has been with us for a little over a week. He's 17 and just graduated from high school. He's thinking about going into the military... He wants to serve HIS country!! Now... how wonderful is that? To help him in his decision of which branch to choose... he's spent time with my honey (Jack) and they've "bonded" !!! Jack told him all about the Navy, took him all over so he could see what that life is... and now he's going to make a decision. Navy or Army!! He's dream is to be a tank driver (boo hoo) so I'm sure he will go that route. What a great kid! It's so funny...when we were that age (Jack and I) we were madly in love with each other and to see him... well.... it just brings back wonderful memories. However, he's so YOUNG! Was I that young? Heck... I don't even remember! Good luck to my sweet Luke! What a great time having him here with us. Today... I'm madly getting everything ready for my B-a-a-a-d Girls Club this weekend - for their make-it-take-it projects. I think the number of gals in attendance will be very low since it's a holiday weekend. However, we will have a blast!!!! Since I've returned from market --- my inspiration is HUGE! I'm making a list of all the new "ideas" I have... whew... is it ever getting LONG! Oh my!! Then I looked at my travel schedule... it's going to be a SUPER-DOOPER next few months! September - Camp Blanding Retreat - YIPPEE!! November & December - COLLAPSE!!! I love being busy... can't stand being bored! Can you tell??? 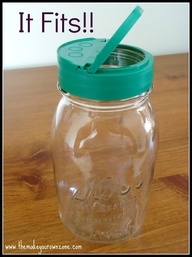 Did you know that the lid to a Parmesan container fits on a mason jar? Isn't that so cool??? I had no clue! I can't wait to try this!! I love this cute packaging! Red ribbon and jingle bells. Now I ask you... how can you go wrong with this concept? 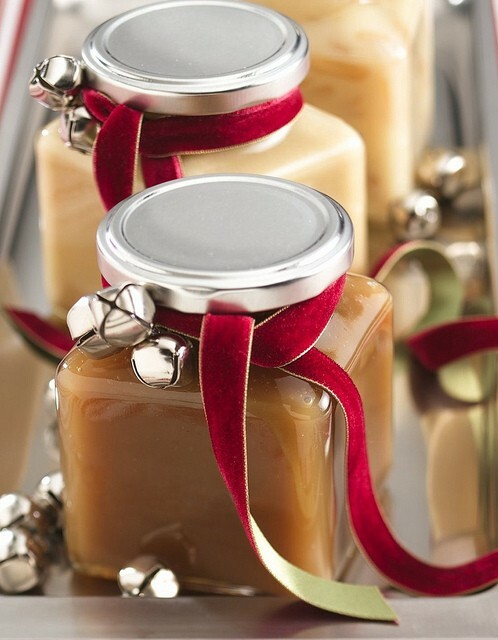 So cute and so simple... especially if these jars are filled with your homemade jelly, caramel.... cool huh? 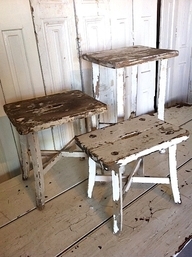 Now I know this may sound a bit strange... but I LOVE STOOLS!! Do you? These... I would give my eye teeth for. OMG... they all match in construction but at different heights. WOW... what a great trio to use in merchandising displays... or just IN MY HOUSE! I know they are a bit primitive - but I guess that's what I love about them... aaaahhhh chippy paint! I'm on the prowl for these type of containers when I go antiquing! 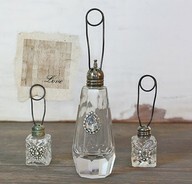 These are pretty glass shakers and they've taken soft wire... twisted it as seen below and then you stick the ends in the holes of the shaker. Wouldn't this be so cute on a buffet table with the name of the item on a sweet little card? Or for place settings at a big dinner? Or how about in a store with information about a product and the price? LOVE IT!!! Now... this is genius and I wished I would have thought of it. When you buy green onions... you know how you sometimes don't need a lot of them... but because of the way they are packaged - they go bad before all of them are used? Well, here is the answer. 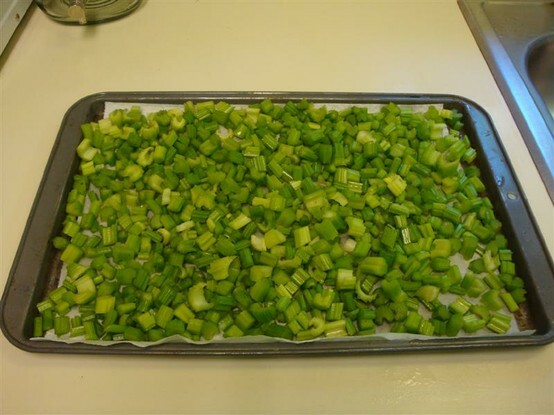 Chop them all up and place on a paper towel and flash freeze them! Then store them in your freezer - after you've placed them into a clean - used watter bottle. Then...the next time you need some green onion - shake out what you need and put the rest back in the freezer! Cool huh? Okay... here we are with chippy paint stuff again! I love how they have taken this old frame and made the picture look awesome inside. Isn't this clever! 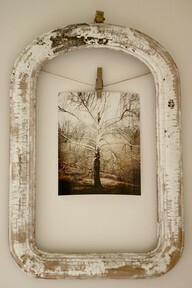 Heck.. you don't need to worry about buying any small frames with this method!! Ahhhhhhhhhhhhhhhhhhhhhhhhh.................. want to make your bathroom smell pretty all the time? Here is the trick. Buy your favorite scented oil - then just place a couple of drops on the inside of the toilet paper roll. Each time it's used... the scent will fill the air. Pretty darn clever huh? What better place to use scented oil!!! Isn't he adorable??? (I know my friend Karen L. won't think so... she's NOT fond of rodents!) 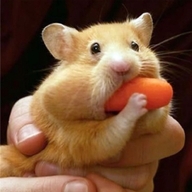 I love the way he's stuffing the carrot in his mouth! Hungry little boy!! Have a great Thursday! 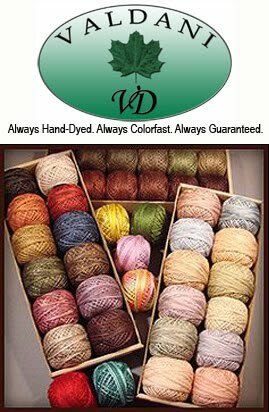 Sew until your eyes go blurry....then take a NAP!